Nowadays, healthcare must keep pace with the new way of communication. For this reason, VoIP services have become an indispensable element in the work of all health professionals. Although we can assume the benefits of using VoIP in healthcare institutions, patients also have a valuable benefit. However, for each individual medical institution or practice, VoIP is also an investment. That’s why we always ask ourselves first – will it be worthwhile and how? VoIP telephony uses the same internet infrastructure that medical and health organizations already have. That means there are no expensive systems to purchase or configure. Also, there’s no costly equipment to rent. At the top, you might need to improve your broadband connection or increase space on your server. When considering VoIP, the first thing that comes to mind is saving on long-distance calls. This could be a major factor if your healthcare cover patients from abroad. VoIP also reduces your costs due to the fact that you can make your calls to a different type of users. Your calls can be transferred to handsets, mobiles, tablets, and laptops. And all of this with great reliability and security. Maintaining this communication system is not expensive. The maintenance you might need will be done by your provider. They will be in charge of updates, user support, etc. Using this technology will reduce your travel costs. Since this system uses video-technology, you can avoid paying travel expenses for your staff. Simply, do a video conferencing, participate in trainings, organize medical webinars, and communicate with your patients. Using VoIP in healthcare can certainly make life easier. First thing, you have a multiple calls option which will deliver mutual calls more efficiently. Calls can be forwarded by priority and it can be tailored by your patients needs. Medical personnel can track the status of each and every call. It is very useful in order to manage calls, time, and priority better. VoIP providers sometimes also offer IVR service (Interactive Voice Response). It is an automated system that interacts with the callers. It consists of a VoIP enabled hardware and software. When a patient makes a call to a healthcare institution, this software will respond automatically. It starts usually with pre-recording greeting lines, and then you will choose an option from the menu. IVR might be a bigger investment, but healthcare institutions will have a longterm benefit. In the first place, IVR performs its function 24 hours/7 days a week. It can also route patients to a specific medical department. That means that neither the patients or the staff will lose their precious time. The expertise and kindness in communicating with patients are a guarantee of your successful practice. It is more than obvious that every medical institution that uses VoIP technology is on the way to success. 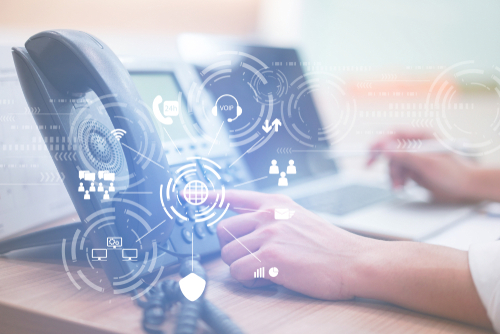 Including VoIP systems within your practice, you can raise the level of communicating with your patients. Patients who find themselves in remote locations can easily get your medical attention. Whether they need advice or just a simple consultation, you can be there for them. Using VoIP, patients can be redirected to the medical department they need. It will keep them from losing time and sometimes that can be a life-saving. The VoIP system is also widely spread in facilities for elder care. Many of those facilities now provide VoIP service for their residents. VoIP solutions can be beneficial for both healthcare facilities as well as patients. It is a service that makes medical care always reachable, and patients will know how to express their gratitude.